Yelp: A Small Business Friend Or Enemy? Social networking sites have the power to help your business – or harm it. It all depends on the way the site is used. In the case of Yelp, it started out as a great way to build your business. 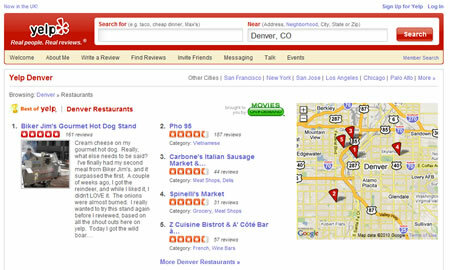 Yelp is a review site that allows you to search your local area for everything from restaurants to professional services. If you are heading out to dinner, find out what other people are saying about places in your area. Or if you have something to say about another business, login and write up a testimonial yourself. Sounds like a great idea, and many small business owners are encouraging their clients to write reviews for it, and even link to Yelp from their own websites showcasing the reviews. But allegations over the past couple of months may change the way you feel about Yelp. Several lawsuits have been filed on behalf of small business owners, claiming extortion from Yelp’s management team. According to the lawsuit, sales reps would offer to remove any negative reviews – if a small business agrees to advertise on Yelp and pay the monthly fee. This makes Yelp, well, just another advertising site. The idea behind a social site is to allow the general population to have their say. No interference by the site itself, or by the small businesses affected by the social site. Good or bad, it’s all there for people to see. While Yelp is denying any wrongdoing, only time will tell. As a small business owner, the best lesson you can learn is to keep track of what is being said about you and your company online. Don’t put too much merit on one item – look at things as a whole. No business is perfect, and you’re always going to have the occasional customer whom you just can’t satisfy. If someone searches and finds 100 positive reviews and 1 negative, they know to question the negative. As long as you have your finger on what’s being said, it’s easier for you to control and put out the fires before they get too strong.